Now Now! hear me – another shocker! I am patting on my back as I am writing this. I concluded a day’s fasting successfully too last year. Again! people who know me would forward the same argument, Rock may absorb water but Suresh going hungry is a bigger Myth than those associated with Shivaratri. Anyways, I chose a great occasion of the holy Shivaratri to test my resolve. AOL Satsang teams rocked the city with melodious renditions of our Bhajans (I know it was enjoyed by the town because I have no reports of anyone receiving rotten eggs or chappals so far – nor did I get any ). Apart from the whole day’s fasting – I swear I had nothing but a few cups of TEA the whole day and night, I partook two Satsangs, 1 at a residence and another in a temple on the outskirts of the city (along with my Centre’s team). This time my whole family was with me and my son so typical of him, stumped all of us asking us, “Why is it that none of our Boy Gods (he called it Boy God’s to mean Male God) have moustaches? All demons in my comics have Moustaches and look terrible” He was insisting me to knock my moutsaches off. Everyone around us were truly left speechless for a moment because, off hand the reply should have been, Bad Guys are shown with Moustaches – but for him his father was not bad (I agree with his views) For courtesy’s sake (and to my fortune) none replied to him that way. So the question was left open for the night. Early this morning he was pestering us for an answer and I promptly went and blogged on my favourite e-hangout (I am sure I will find the answers to his question as soon as people start seeing this). Auspicious festival of Mahashivaratri falls on the 13th or the 14th night of the new moon during Krishna Paksha in the Hindu month of Phalgun. The Sanskrit term, Krishna Paksha means the period of waning moon or the dark fortnight and Phalguna corresponds to the month of February – March in English Calendar. Shivaratri Festival is celebrated on a moonless night (Chaturdashi to Amavasya). Shivaratri or ‘Shiva’s Great Night’ symbolizes the wedding day of Lord Shiva and Parvati. Many however, believe, Shivaratri is the night when Lord Shiva performed the Tandava Nritya – the dance of primordial creation, preservation and destruction. Devotees give a ritual bath to the Lingam with the panchagavya . 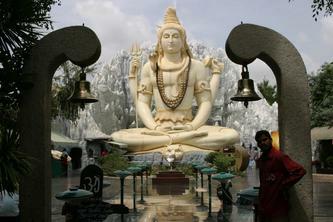 Celebrations of Shivaratri Festival mainly take place at night. Devotees of Lord Shiva throng Shiva temples across the country and spend ‘the Night of Lord Shiva’ by chanting verses and hymns in praise of the Lord. According to Shiva Purana, sincere worship of Lord Shiva yields merits including spiritual growth for the devotees. It also provides extensive details on the right way to perform Shivratri Puja. Shiva Purana further says, Performing abhisheka of Shiva Linga with six different dravyas including milk, curds, honey, ghee, sugar and water while chanting Sri Rudram, Chamakam and Dasa Shanthi pleases Lord Shiva the most. According to mythology, each of these dravya used in the abhisheka blesses a unique quality . · Milk is for the blessing of purity and piousness. · Yogurt is for prosperity and progeny. · Honey is for sweet speech. · Ghee is for victory. · Sugar is for happiness. · Water is for purity. Besides, worship of Lord Shiva on Shivratri is also considered to be extremely beneficial for women. The festival holds special meaning for the ladies. They pray to Goddess Parvati also called ‘Gaura’, the giver of ‘suhag’ for good husbands, marital bliss and a long and prosperous married life. While, married women pray to Shiva for the well being of their husbands and sons, unmarried women pray for a husband like Shiva, who is considered to be the ideal husband. What is significance of Shiva Linga—“The Linga is just a symbol, a sign, an illustration, of the beginningless, the endless, the limitless – for it has no limbs, no face, no feet, no front or back, no beginning or end. Its shape is like the picture one imagines the Niraakaara (Formless) to be. In fact, linga means – leeyathe (that in which all forms and names merge) and gamyathe (that towards which all names and forms are proceeding, to attain fulfillment). It is the fittest symbol of the All-pervasive, the All-knowing, the All-powerful”. Once there was a hunter, and he one day went into the forest to procure meat for his family by hunting some animal. He wandered up and down in the forest from morning till night in search of game but was unable to shoot any. At last, when night overtook him, he climbed up a Bael tree to escape from a wild animal that was pursuing him, being roused from its lair by the hunter. The animal was lying down at the foot of the tree quite certain that the man would fall down either from sleep or from exhaustion, and that he might eat him. The hunter, exhausted as he was from his exertions and hunger, wished to scare away the animal by throwing handful of bael leaves. These leaves dripping with water on account of the recent shower, fell on a Siva-Lingam that was near. The night happened to be the Maha-Sivaratri night. He had fasted during the whole day since he could not find anything to eat. The drenching rain constituted a bath and his action of throwing the bael leaves on the Siva-Lingam, the wor­ship of Siva on the Sivaratri night. Though his actions were not intentional to worship Siva, yet he is said to have gained heaven as he had observed the Sivaratri – Vratha unwittingly. Namo Parvati Pathe! Har Har Mahadeo!! !